Please turn your head to exhibit A on the left sidebar. No, your other left. You will notice a link to Bossy's Excellent Road Trip. She possibly could be coming through my little city to visit humble little me! And Emma! 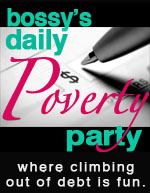 Bossy is on of the funniest bloggers on the web and I would be totally excited to hang out with her for a glass of wine or some good Mexican food. I enticed her with pictures of my Irish Wolfhound. I hope it worked! I am a little ashamed of my blogging "habit" but I guess I'm not alone. It's just such a nice outlet with all the great interesting writers out there. I love to read and it's a quick fix when my motivation is low. And speaking of reading and quick fixes but not really because it's such a bad segue so just let's all ignore this weird long run on sentence, how about we encourage Sistah to contribute to this blog, shall we? SISTAH (She's my sister, you know the old one? The one whose birthday for which I flew allllll the way across country to celebrate?)! I know you have writing genius in you!!! Come join me here! It's free and easy (I started to write cheap and easy but I thought that didn't sound as nice). Let's all chant: SISTAH! SISTAH! Hey Sistah! You're even older than ME! I like hangin' out with oldsters. Makes me feel young. So, come one, join the blogosphere!